I’ve off handily mentioned previously how I like to buck certain trends when it comes to my reviews, for example avoiding obvious jokes or analogies with games like Bridgy Jones or Aliens: Colonial Marines. I don’t read other reviews before writing my own, but I normally can predict what certain other writers may use to bolster their word count. With Gloomy Hollow you can see straight away where all the “if you like X you will love Y” and “Like Z had a love child with X and Y is the child” are going to be alluding to. 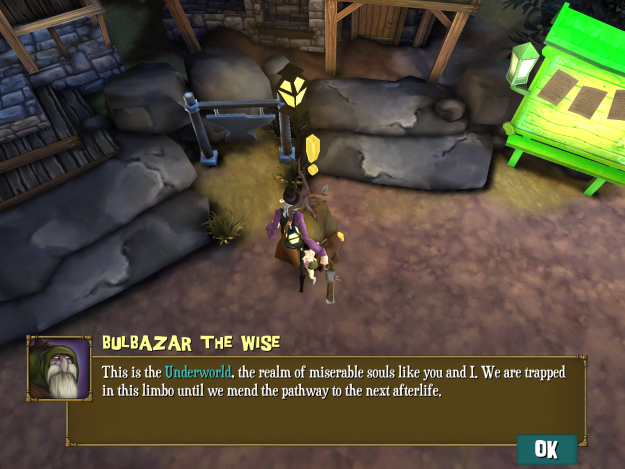 Well all I can say for now is that there is no way I can write this review without saying the following, Gloomy Hollow is like Diablo if it was made by Tim Burton, and Danny Elfman did the soundtrack. I should also point out now I’m not a huge fan of Tim Burton. A lot of this is down to his whole “I wear a top hat, how wacky am I?”. He’s the office ‘character’, the one who wears a novelty tie every day, or turns up in a beret waiting eagerly for someone to question it. “I wrote a lymeric”, says Mr Burton excitedly, willing me to ask him to read it aloud, “Oh sod off” I reply. Sorry this got a bit off topic for a moment there. Gloomy Hollow is the latest offering from Skyrock Games, published by Chillingo. 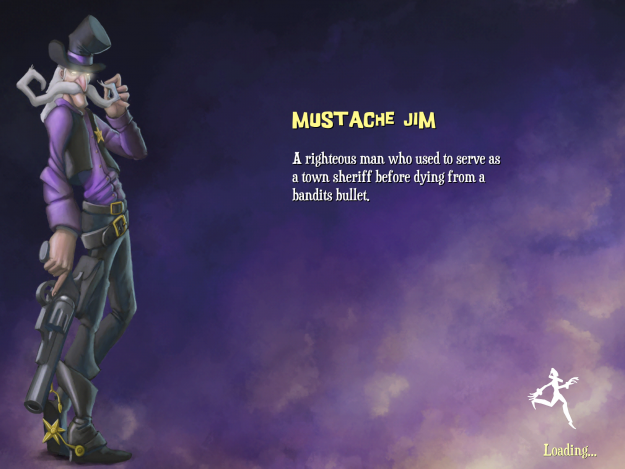 The game starts with you controlling Moustache Jim, a sheriff. As you wander along, with touch controls or the much more useful virtual stick, you are greeted to this unfamiliar place by a couple of bugs. Tapping the shoot gun button you see numbers fly into the ether above them, this is your first hint that the game has allusions of RPG’dom. Once you have made it to town you are shown around your hub, there’s a dude selling stuff, a chest which seems to have a black holes worth of space, a blacksmith and the town mayor who also seems to be the town’s wimp. You are sent on a quest to find a smith called Smithy, and then a dancer lady called Rosie, soon you realise that all is not as it seems. You are dead, and Gloomy Hollow is the afterlife, unfortunately said afterlife has all gone a bit crazy and bitey so you, picking between the sheriff, the dwarf and the dancer, must venture out completing quests and cutting up foes to bring back a little sunshine to Gloomy Hollow. I played with the virtual stick controls, basically this means sliding your thumb around moves your character around the isometric landscape. With your right thumb you can select your basic attack, and once you level up enough, you can also select your special moves that burn through mana. If you want to gain the maximum extra keys, to open gates and chests, on each level you must complete three objectives, firstly you must find the end, simple, also you must kill all foes, again simple, finally you must find all five glowing blue pieces of soul…ah. Throughout the first ‘world’ of the Marshlands this is a relatively simple act, then when you hit the desert canyon of ‘word two’ things take a tumble, a couple of the blue soul pieces are hidden in such inane places the fun can sometimes be lost. Killing does the usual Diablo trick of potentially dropping what the cool kids call ‘loot’. 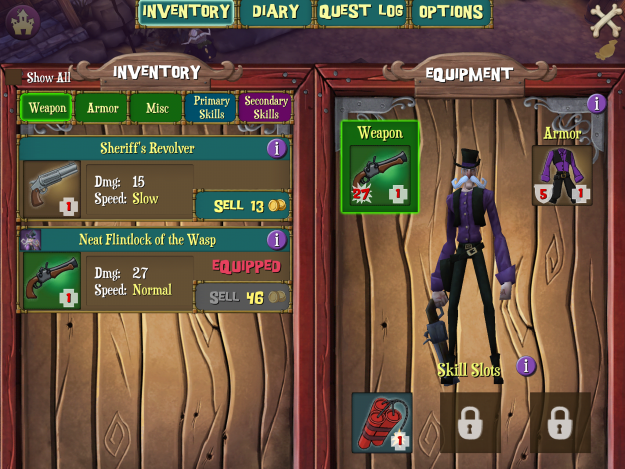 With the ability to change between the three characters in the town whenever you want this means you will occasionally pick up gear for another character, but with levels and skill points being divided equally amongst the party this is never an issue, a quick change of armour here and a new shiny weapon that leeches life there and you’re ready to go back on the road. Replayability is a wonderful thing in iOS games, the want to 100% a game mixed with customisation of characters never goes amiss. 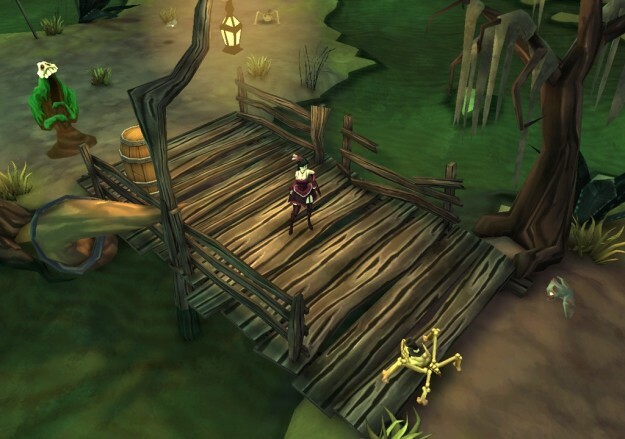 This is where Gloomy Hollow stands out, among the assorted freakish townfolk is a notice board laden with quests encouraging you to return to early levels to complete new objectives like kill 5 of a particular enemy. The want to carry on is a great thing about this game, the ‘just one more level’ mentality plays out well and finding the right character for you is a must. The sheriff is all about ranged gun attacks, the dwarf hits things hard and Rosie, the dancer and my personal favourite, is all about quick and painful moves. If you level her up a bit you also gain access to the best special power in the game, an ethereal soul copy of Rosie joins the field to play at your side. The game only suffers in one area and that’s the bugs I encountered, hopefully rectified soon after launch with a patch. These ranged from crashes when the game was working out my score after completing a level, forcing me to re-do the whole stretch again, to bugs with registering when I was stood by another character I wanted to play as. If these bugs get exterminated then I would say this game was close to perfect, the world and music that’s been created is a joy to run around. The levels within each ‘world’ are similar but with enough differentiating it from the previous. I truly hope that down the line the developers might consider adding co-op, even in local wifi, as this is a game world you want to share with others. Overall this was a great game experience and one I plan to continue long after this review has gone live.